The very modest outside appearance of the Swedenborgian Church can be deceiving. 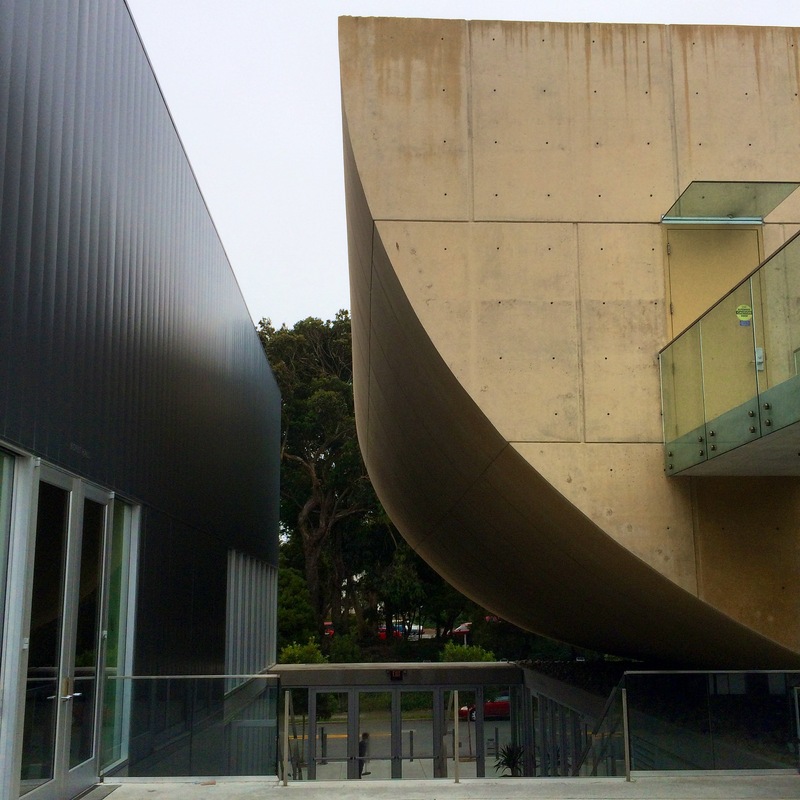 Once inside, one is taken aback by the architecture and design of this sacred space. Friday morning came early. 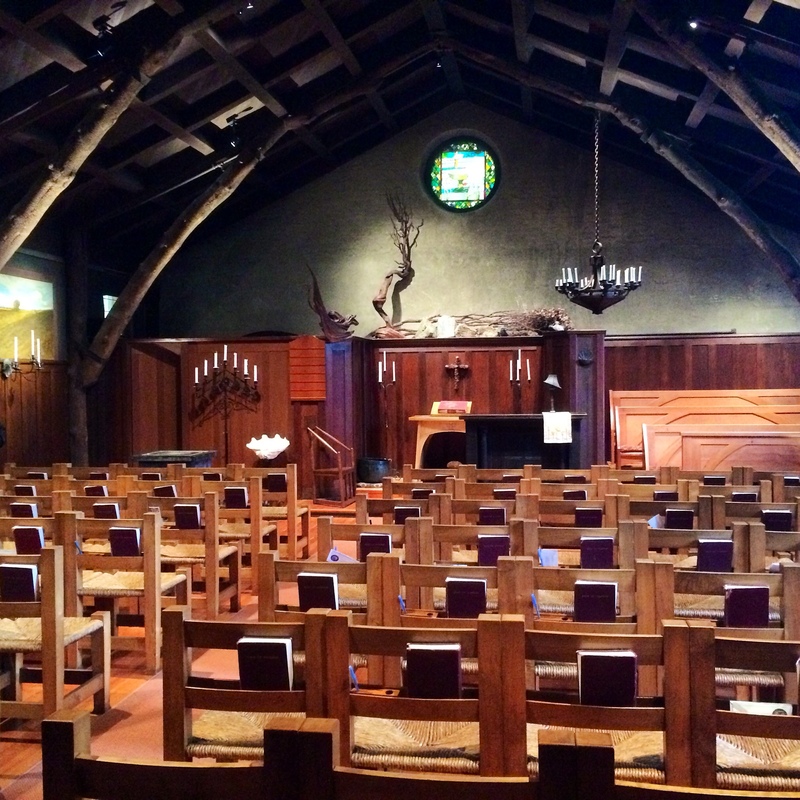 By 8:00 am I was arriving at Swedenborgian Church, a historical landmark church just on the outskirts of the Presidio. As I walk in through the garden, I find myself in a modestly sized, yet beautifully appointed garden. Later I will learn that the man who envisioned this church intended us to walk through the garden in order to enter the nave. That is because he considered the garden to be part of the church, he wanted us to walk through the wonder of creation as part of the worship experience. I’m admiring an apple tree with fruit that seems ready to be plucked and eaten, and that’s when Rev. Junchol Lee walks out the parish house door. “You must be Sergio,” he says as he begins to show me around the garden. I remark on the apple tree and he tells me he’s been eating from it in the past few days. And then we go inside the church. I’ve seen this place in pictures and I’ve been very eager to see it in person, it is unlike any other church I’ve ever seen. And the pictures simply do not do it justice. The Rev. Thomas Worcester founded the first Swedenborgian Church in America in 1795, in Boston. In 1867, his son, Rev. 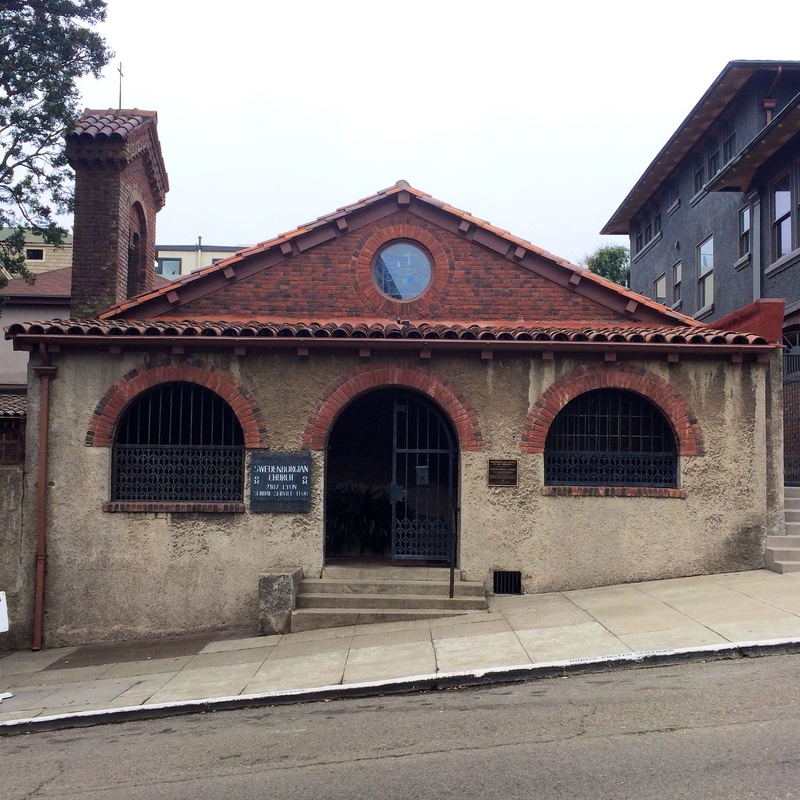 Joseph Worcester, started two Swedenborgian Churches in San Francisco, which no longer exist. Rev. Joseph Worcester was deeply involved in the planning of the present church and it was finished in 1895. Inside the church. Notice the natural arch beams and the iconic chairs, one of which was given to the Smithsonian Institute for its design and historic significance. This is a small church, there are approximately 80 chairs in the nave. Everything inside this Arts & Crafts style building has a purpose and a meaning. 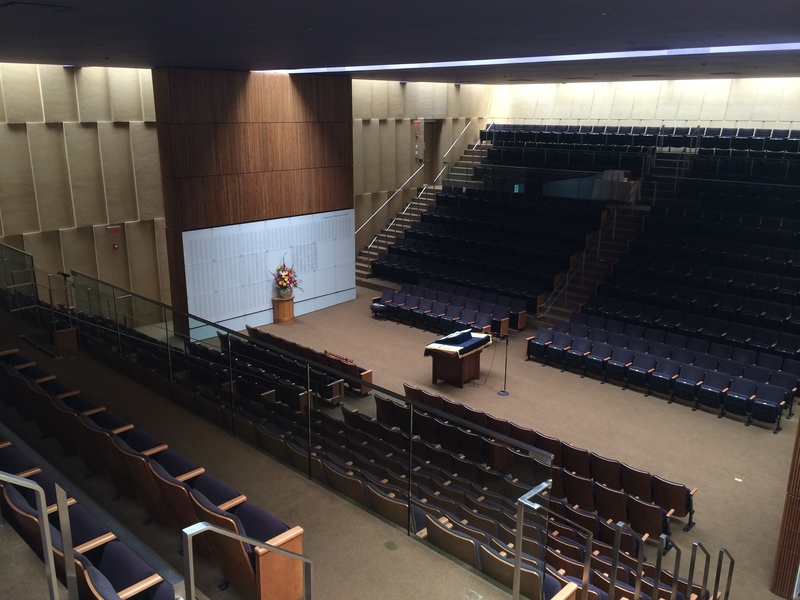 The chairs, for instance, were chosen instead of pews to make this space more versatile. Rev. 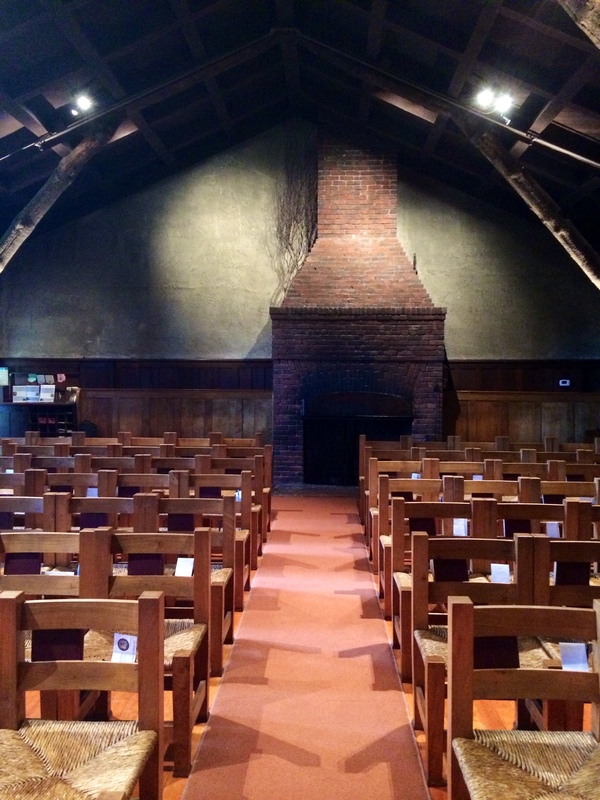 Lee tells me that after service in the early days, congregants would move the chairs to gather around the fireplace in the back of the church and eat together. The fireplace is off center in relation to the altar and the axis of the church. I haven’t noticed this apparent anomaly until Rev. Lee points it out. “It would’ve made more sense to center it, but they intentionally made it asymmetrical,” he tells me. “Why on earth would they have done that?” I wonder. “Nature is not symmetrical and yet we feel most comfortable in nature,” he explains. Everything about this space attempts to bring nature inside as a reminder that God is in nature, that we experience God in creation. The arches that hold up the ceiling are raw logs, they look like they were cut yesterday, and the curves are organic, not symmetrical. There are branches and other preserved greens and shrubbery inside. 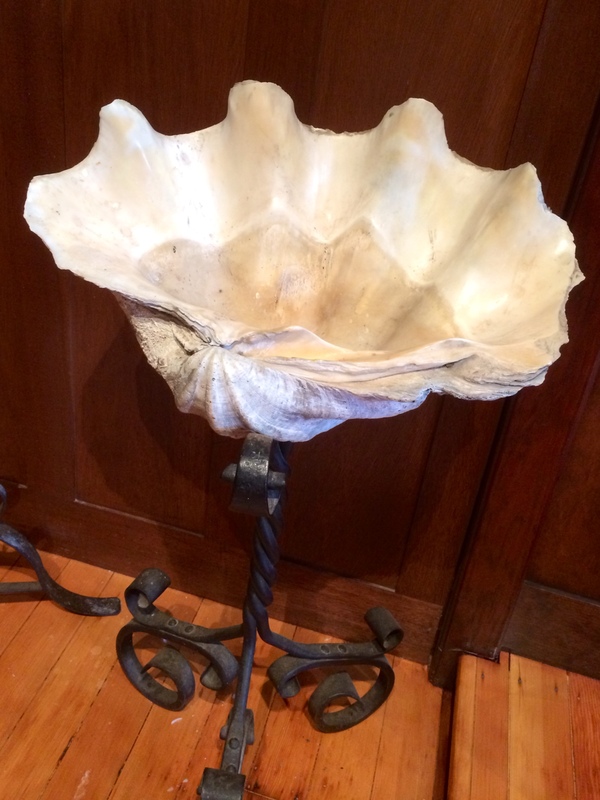 The baptismal shell is an actual conch shell, and it happens to have been used to baptize Robert Frost in 1881, in one of the original Swedenborgian churches before this one was built. This church is an architectural representation of Emanuel Swedenborg’s theology. And it is magnificent, in an understated, humble sort of way. Rev. Lee is just as fascinating as this church. “I wanted to be a Buddhist monk,” he tells me. 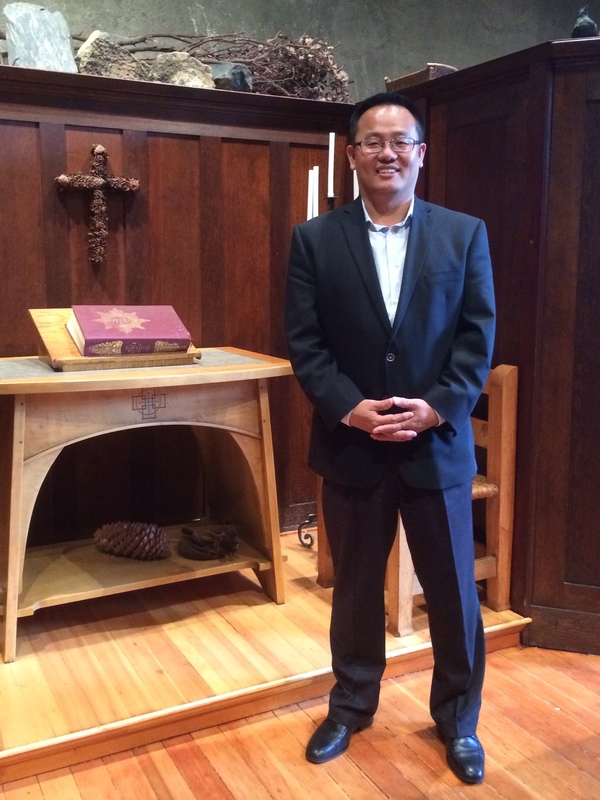 Having been born and raised into a devoutly Presbyterian Korean home, he realized that leaving the faith to follow his desire of a monastic life of Buddhism would have been devastating to his family. He abandoned that dream, but as life would have it, a few years later he ended up in New York living with relatives who happened to be fervent Swedenborgians. As we’re standing near the altar, I point to a large bell; it looks quite Buddhist and a little out of place here. He tells me it was a gift to the church and he often uses it to lead Taoist meditation. Wait, what? “A good thing is this congregation doesn’t mind having a half-Taoist, half-Swedenborgian minister,” he says, just like that, like it’s no small thing. I tell him I’ve been looking for a Taoist Center to visit and he tells me it would be very non-Taoist to have a Taoist Center. I should’ve known this. Rev. Lee is a practicing Taoist and he has only started leading meditation groups because people have asked him to. But he is also a fully trained, seminary-graduate, Swedenborgian minister. 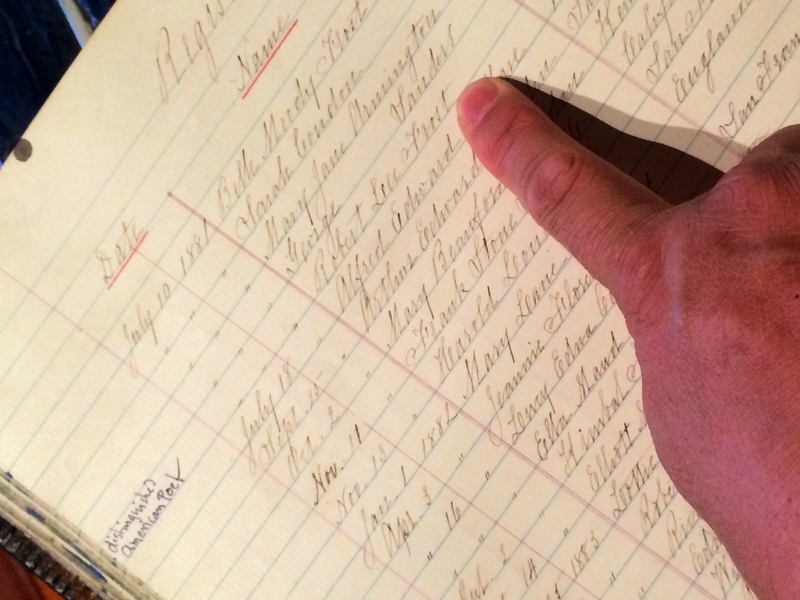 San Francisco Swedenborgians have kept handwritten records since before this church was built. Here, Rev. Lee points to the name of Robert Frost, whose mother was a devout Swedenborgian. If you’re anything like me, you’re probably wondering what Swedenborgianism is. I didn’t even know I was pronouncing it wrong: it’s Swedenborg (hard G) and Swedenborgian (soft g). Emanuel Swedenborg was born in Stockholm, Sweden, in 1688. He was a respected scientist and inventor who later had a spritual awakening that led to him devoting the rest of his life to theological work and inquiry. While he didn’t intend to establish a new church, his followers did so years after his death. Swedenborg’s views were very much out of line with mainline Christianity and therefore, as Rev. Lee says, “They never liked us.” I ask what are some main differences. “We deny the existence of original sin, therefore we don’t believe in instant salvation and we don’t believe in predestination,” he says, adding that one does not become saved by simply uttering some “magical words.” Another point of difference between Swedenborg and mainline Christianity is the understanding of heaven and hell. “Hell is not a place of punishment but a place of choice. We don’t belive that God created hell in the beginning. Evil was simply a choice made by humans. So, heaven and hell are different and how you get there is different as well,” he tells me. But perhaps one of the most controversial views of Swedenborg’s is that of the second coming of Christ. Rev. Lee tells me that, “In Swedenborg’s mind, Christ came to earth once physically, why does he need to come back physically again? He insisted that the second coming would be spiritual in nature.” This was a big problem for mainline Christianity, if they give up the second coming of Christ, Rev. Lee says, “They have to give up half of the power they have over their congregations. There’s no last judgment anymore? Woohoo, we’re free! 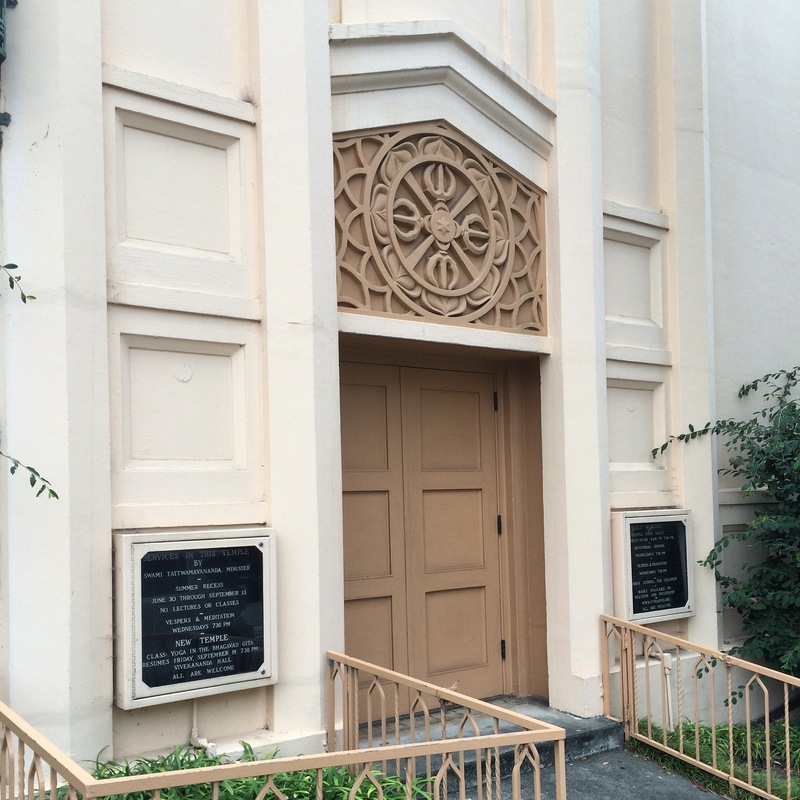 Swedenborg nurtured a real freedom of choice for the congregation,” says Rev. Lee. “In a way that’s why we are small, we’ve been small and I don’t think we’ll be really huge in years to come,” he tells me. The Baptismal Shell, which was used of Robert Frost’s baptism. There is another reason why Swedenborgianism has not taken over the world, and it’s a delicate one. In its heyday, the church counted among its ranks some 10,000 members. But these were people, as Rev. Lee explains, who were literate and intellectually-driven. “To be a Swedenborgian, you need to be able to read and write,” he tells me, remarking on the significance of such a high number of educated members in the 1800’s. “In a way, we have been a very elite-oriented, intellectual practice,” he admits. “The mission statement of the first Swedenborgian gathering, which happened in England, was to translate and publish the writings of Swedenborg,” says Lee. This emphasis on intellectual development set the tone for the church and unintentionally crippled its growth because, there wasn’t much of an emphasis in fellowship. “This was our strength and our limitation, and it still is today,” says Rev. Lee. Facing the back from the altar area, one can see the intentional asymmetry of the design. The fireplace, the aisle and the altar are all out of alignment, to evoke the asymmetry of nature. With its focus on individual spiritual and intellectual development, it only makes sense that this is the kind of Christian church which would be prefectly at peace with having a half-Taoist minister to lead them. Rev. Lee explains how Swedenborgianism is compatible in this way with Eastern philosophies and religion, “Buddhism and Taoism say you can’t help others achieve enlightenment, you can only do that for yourself.” He explains you must help others in life, but ultimately the individual is responsible for his own achievement. He tells me one of the biggest criticisms of Swedenborgianism today is the question of serving the community. “We ask that of ourselves, too, what are we doing for the community?” says Rev. Lee. They do seem out of trend in this regard. 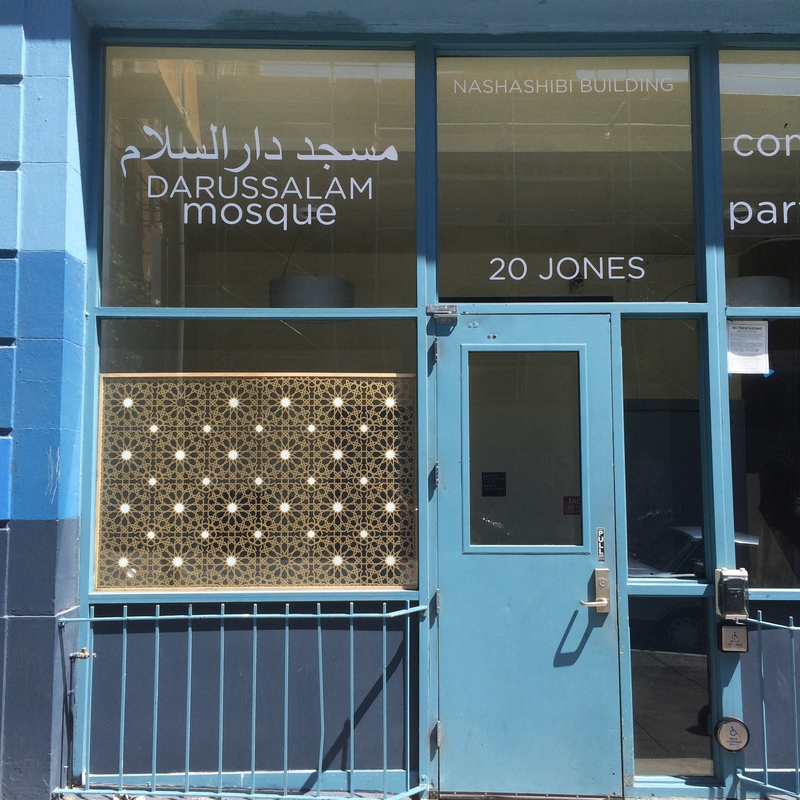 Every single church, temple, mosque, synagogue and religious organization I’ve come in contact with seems to have as its highest priority to be a service to the community. This is a wonderful thing, of course, but I wonder if the balance is a little off. What are religious institutions sacrificing in exchange for this overwhelming emphasis on serving the community? “A lot of times, we do these things (serving the community) to make ourselves feel better,” says, Rev. Lee, and he adds, “To me, religious, spiritual or even philosophical practice is not to make you feel better. It is an expression of your inner desire or belief, and it is something you do regardless of reward, compliments or acknowledgment.” These are difficult ideas to grasp, and as I mentioned before, it is delicate territory we’re treading on. But he helps me bring it all around and it all begins to make more sense to me. Rev. Lee wonders, “If churches encouraged their members to serve their communities without any recognition, without any reward, would they do it? If they were to say, ‘You know what? Jesus will be indifferent (whether you serve or not).’ I don’t know if they would do it!” So, it comes down to motivation. Do we do these good deeds because we think it’ll give us good karma, merit, favor? “Even Jesus spoke to this; he criticized the hypocrites, he said ‘If you do a good work, do it in such a way that the right hand doesn’t know what the left hand is doing. '” This reminds me of Jesus’s exhortation to pray in private and not in public like those who do so to draw attention. 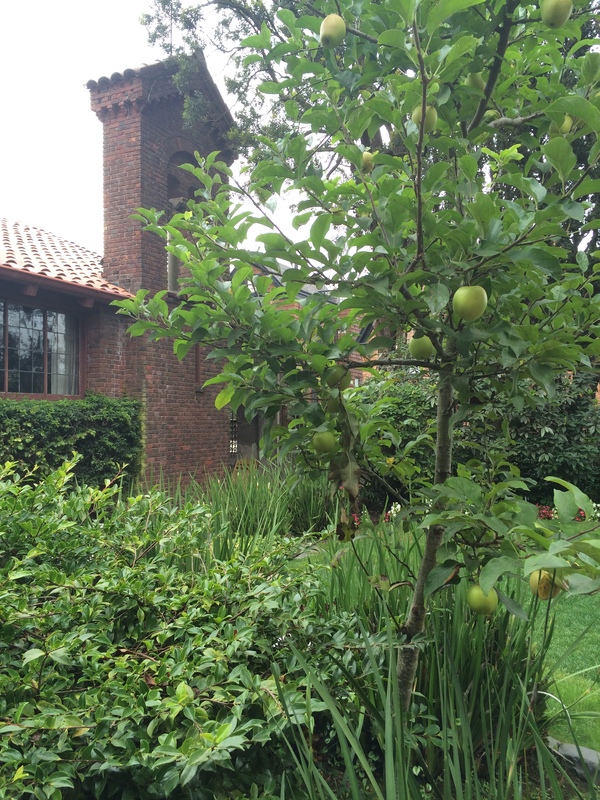 A view of the garden, with the apple tree in the foreground. But Swedenborgian thought does not advocate for individualism or isolation. 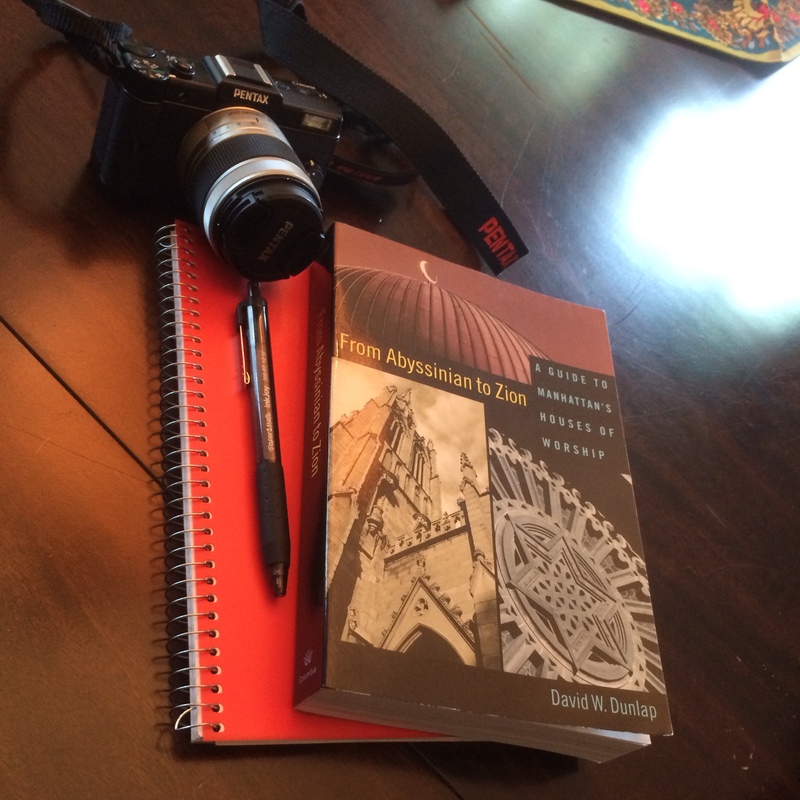 In Swedenborg’s mind, Rev. Lee tells me, “God is pure love and love requres mutual relationship. A relationship with God and a relationship with others. In Swedenborg’s mind, the world was created in a process of pure love.” And in Rev. Lee’s mind, God is very much present in his life. God is not the product of some intellectual endeavor. He recounts for me a couple of separate instances in which he has experienced in very real and amazing ways the voice of God. At crucial times in his life, when Rev. Lee faced uncertainty or adversity, he has felt and heard God’s direction in very real ways. “The way I experience God is to me a very interesting thing,” he tells me, “He’s wiser than any human being could ever be, truly loving, never insulting or overwhelming, always embracing and nurturing and caring. That’s the way I experience it. To me, if that’s the divine, I love to embrace it. There’s nothing to resist about!” he says. After my visit at Swedenborgian Church, I headed over to Darussalam Mosque for Jumu’ah (Friday prayer and sermon). The Imam delivered a sermon expounding the virtues of kindness to others and right living according to the Holy Quran. 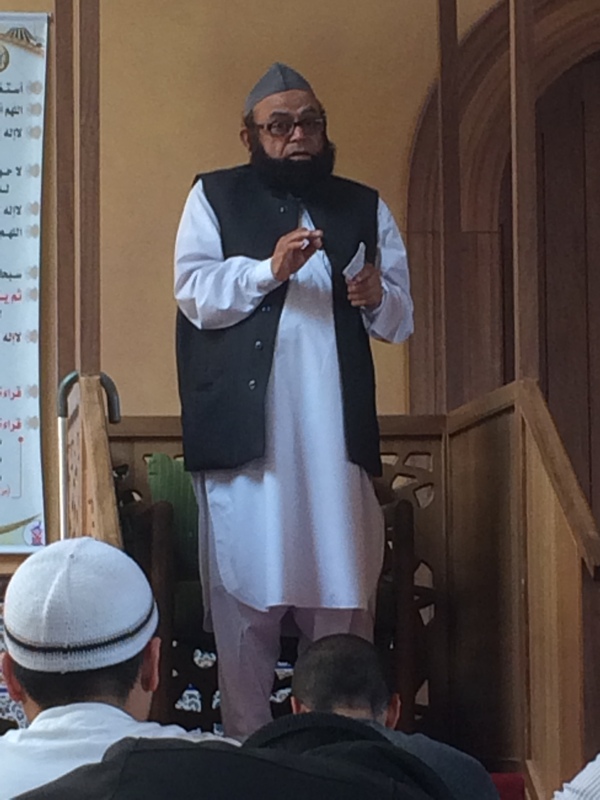 He exhorted congregants to do good unto others, regardless of their faith or lack thereof, saying, “We are not meant to ask, ‘Hello, are you a muslim so that I may be kind to you?’ but rather be kind to all, regardless.” He insisted rather passionately that the horrors taking place in the name of Islam have nothing to do with the teachings of the Prophet or the Quran, and that the calling was to be righteous and compassionate. The mosque was full, shoulder to shoulder, wall to wall. It was a wonderful experience for me. The entrance to the Mosque. 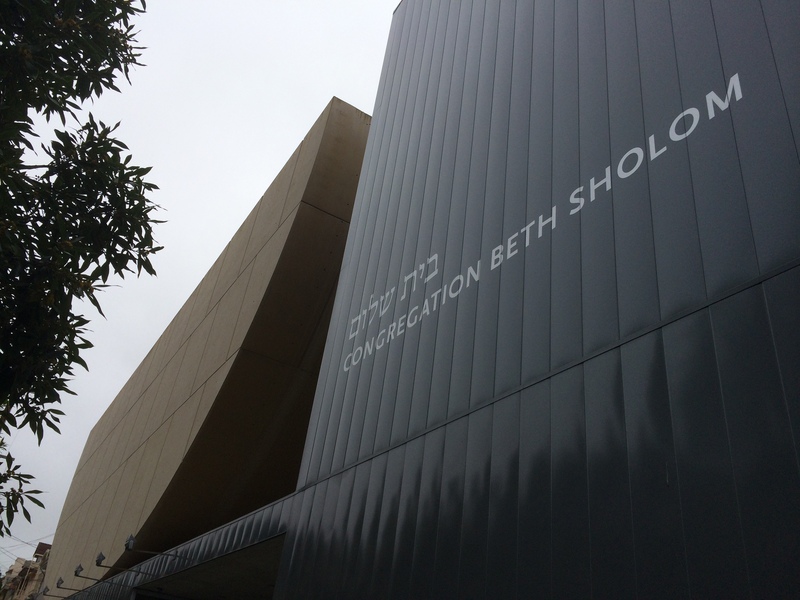 One of the sacred spaces toward the top of my list was Congregation Beth Sholom. 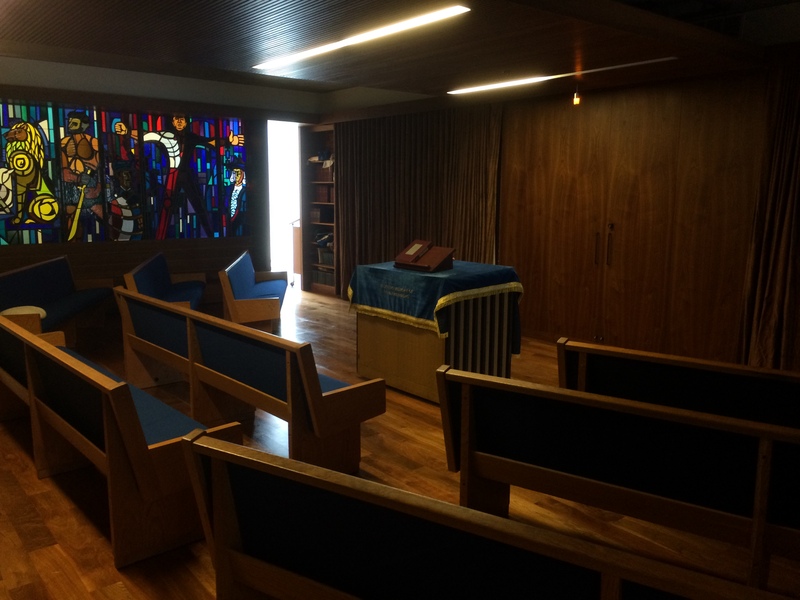 While I was unable to attend services, I was kindly allowed to visit the Synagogue and spend some quiet time there. Here are a few photos of this wonderful place. A view from the top. 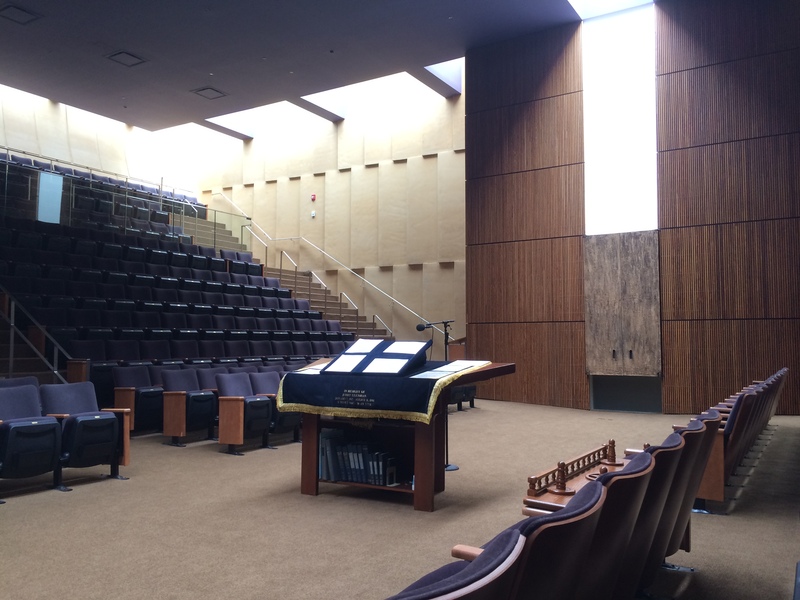 The Yahrzeit Wall can be seen in the back. A view of the other side, with the ark in view. This lovely chapel is used every day of the week for prayers and services. A detail view of the outside of the synagogue. When seen in full, the shape is evocative of a menorah. 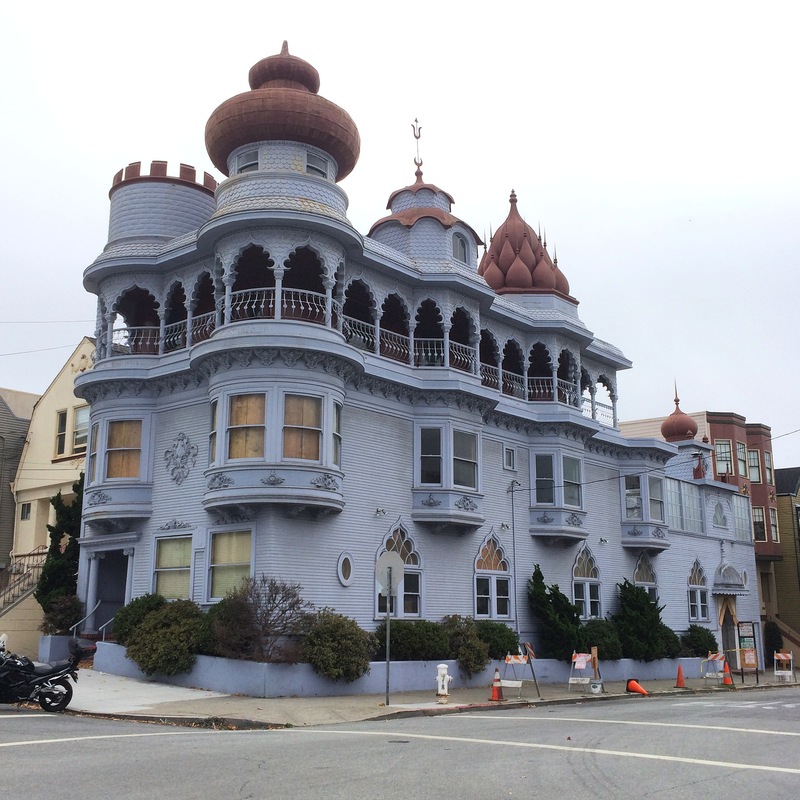 My last stop for the day was the Vedanta Society of San Francisco. Vedantas break for the summer, so there were no services being held during my visit. I was, however, able to explore the temple and sit for meditation in the main shrine room. 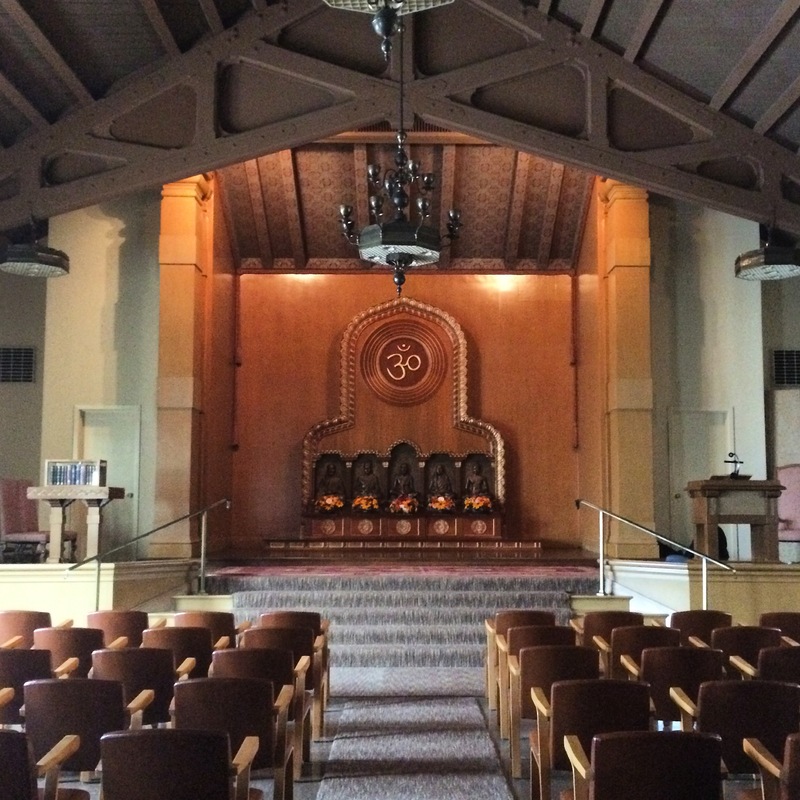 The Old Temple of the Vedanta Society, built in 1905, was the first Hindu Temple to be built in the west. It is currently undergoing renovations. The entrance to the new temple.